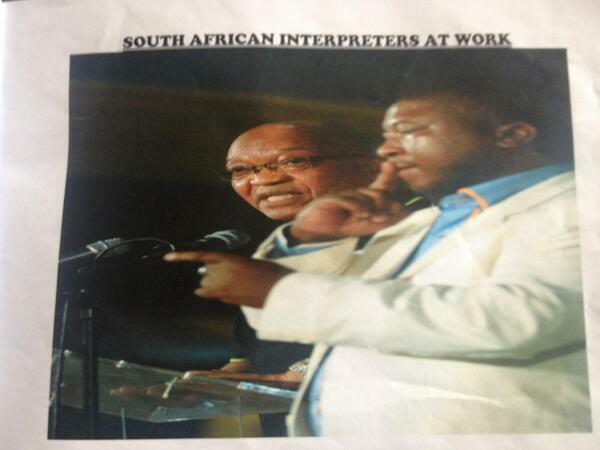 The Deaf Federation of South Africa says the interpreter, Thamsanqa Jantjie, was a "fake." Jantjie says he was hallucinating angels during the service, but defended his performance. The Deaf Federation of South Africa said that the sign-language interpreter on stage during a memorial service for Nelson Mandela was a "fake." The Guardian reports that Hendrietta Bogopane-Zulu, the South African deputy minister for women, children and people with disabilities, said it was a mistake to hire Thamsanqa Jantjie but denied he is a fraud. In an interview with South African paper The Star, Jantjie claimed he was suffering from a schizophrenic episode during the memorial. The Star reported that Jantjie takes medication for his schizophrenia, was "medically boarded" a few years ago and that he relies on a social grant now. Thamsanqa Jantjie at his home in Bramfischerville, South Africa. "There was nothing I could do. I was alone in a very dangerous situation. I tried to control myself and not show the world what was going on. I am very sorry, it's the situation I found myself in. "Life is unfair. This illness is unfair. Anyone who doesn't understand this illness will think that I'm just making this up." Jantjie said he works for a company called SA Interpreters and was paid for the event. There are now reports that the owners of SA Interpreters have "vanished." "What happened that day, I see angels come to the stadium ... I start realizing that the problem is here. And the problem, I don't know the attack of this problem, how will it come. Sometimes I get violent on that place. Sometimes I will see things chasing me." "I had a breakdown when I see angels come from sky to the ground." However, Jantjie has also defended his interpreting at the memorial in an interview with 702 Talk Radio, contradicting his other statements, and calling himself a "champion of sign language." In the interview, Jantjie said he is "absolutely" happy with his performance. Jantjie said he was "sad" about the controversy and asked: "If my interpreting was not right in all these years, why should it be an issue now?" When asked directly about his "schizophrenic episode" Jantijie said he "wouldn't feel comfortable to talk about it on the media, it's not a thing I was referring to the media." He did go on to say that the real issue he wanted to focus on was the claim he "interpreted wrong," saying: "If I then interpreted wrong, why is it an issue now?" He went on to note that his interpretations were not an issue when he interpreted "many big events in South Africa." When asked again about his schziophrenia, he said: "I wouldn't like to discuss my mental status on the media" but confirmed that he is "currently a patient" and "receiving treatment" for schizophrenia. He also confirmed he is a "senior interpreter" for the company SA Interpreters. Despite Jantjie's claims that his interpretation skills had never been questioned before, it appears that might not be true. Wilma Newhoudt-Druchen, the first deaf woman to be elected to the South African parliament, has also said that at previous December appearance, a deaf person in the audience videotaped the event and the federation for the deaf analyzed the video and submitted a formal complaint to the African National Congress. The ANC never responded, the AP reports. Footage has emerged of Jantjie beside President Zuma at the ANC Centenary Celebrations in Bloemfontein, South Africa, in January 2012. 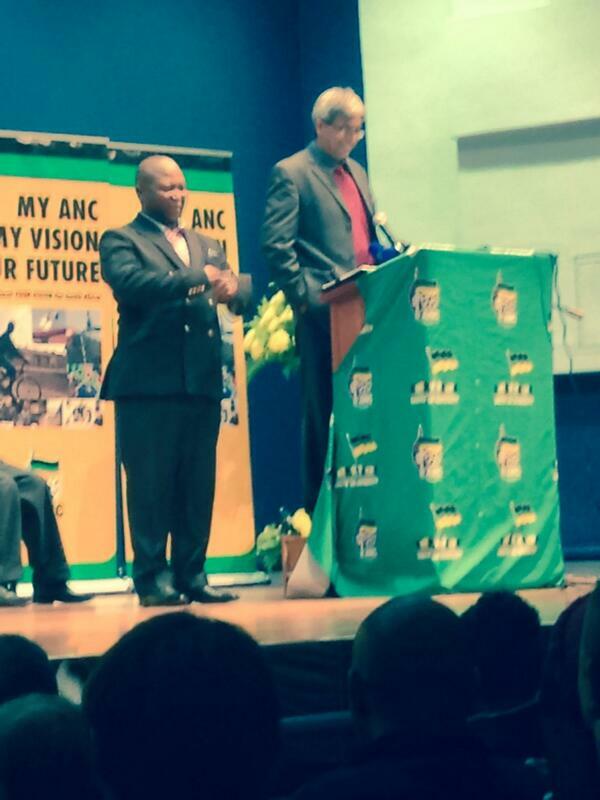 @charlie_swin @Deaf He also "interpreted" at the ANC Elective Conference in Mangaung last December. It is as if he came back with vengeance! He also showed a BBC journalist further proof that he had worked with President Zuma before. A complaint was filed with the ANC after Mandela's memorial. 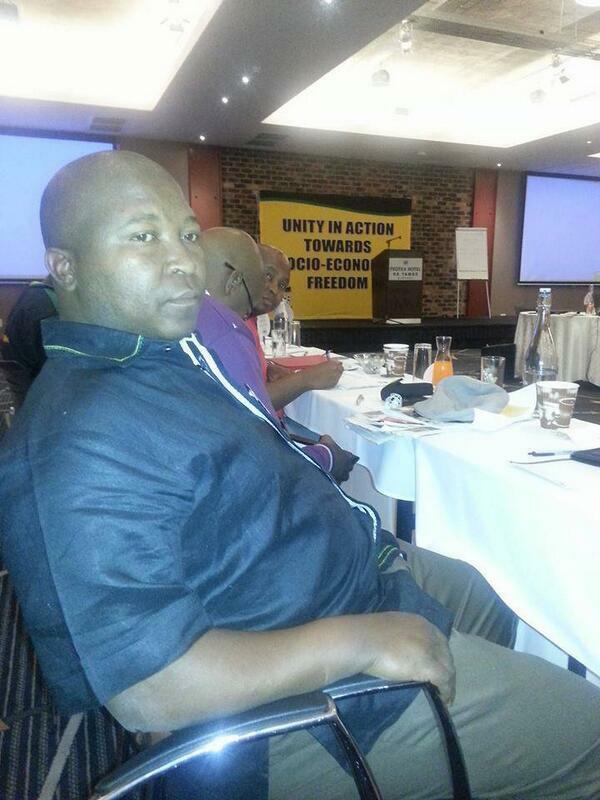 Despite apparent proof of previous work with the ANC, a spokesman on Wednesday said: "I don't know this guy. He doesn't work for the ANC. It was a government event." @braamjordaan @charlie_swin do you know who it is? To me this is fraud and oppression coming from the ANC. International media cd milk it. However, when asked if the ANC approached SA Interpreters for an interpreter for the memorial, Jantjie responded with "absolutely." When the interviewer asked him to confirm that he has formal qualifications for sign language interpreting, he said "yes." The deaf community, sign language interpreters, and Mandela mourners alike were initially outraged by the "fake" interpreting at the historic, and globally televised memorial. Bruno Druchen, national director of the Deaf Federation of South Africa, was one of the first to raise suspicions during the memorial. Please get RID of this CLOWN interpreter,please! And when Thamsanqa Jantjie's name was revealed, things only got worse. 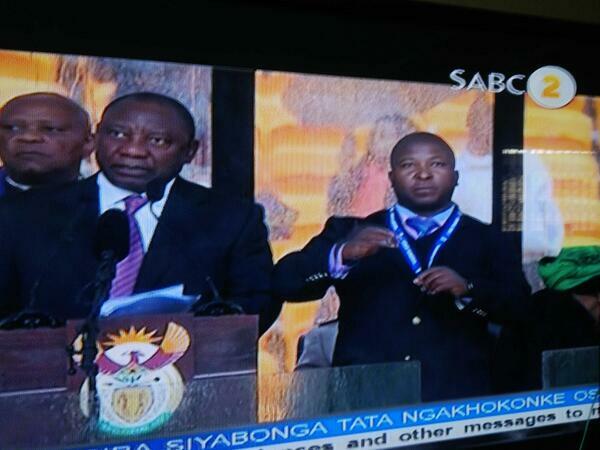 His name: Thamsanqa or Thami Jantjie #fakeinterpreter PLEASE ENSURE that he&#39;s NEVER NEVER HIRED EVER AGAIN! His name: Thamsanqa or Thami Jantjie #fakeinterpreter PLEASE ENSURE that he's NEVER NEVER HIRED EVER AGAIN! South African parliament member Wilma Newhoudt has also confirmed Jantjie didn't actually communicate anything with his hand and arm movements. Ingrid Parkin, principal of the St. Vincent School for the Deaf in Johannesburg, said she's received complaints from the deaf community around the world, because he looked like he was "signing gibberish," the Guardian reports. Jantjie apparently used no facial expression to convey the emotions of the speakers, which is an important aspect of sign language interpretation. "This is a warning to other sign language interpreters who are fake and go about interpreting," Druchen said. "I am hoping the South African government will take notice of this." The AP reports that fake sign language interpreters are a widespread problem in South Africa because many attempt to pass themselves off as legitimate for money. "Those hiring them usually don't sign, so they have no idea that the people they are hiring cannot do the job,' she [the principal] said. 'They advertise themselves as interpreters because they know 10 signs and they can make some quick money,' said Parkin. 'It is plain and simple abuse of the deaf community, they are taking advantage of the deaf community to make money."